Is This The Most Beautiful State Capitol Building In The United States? 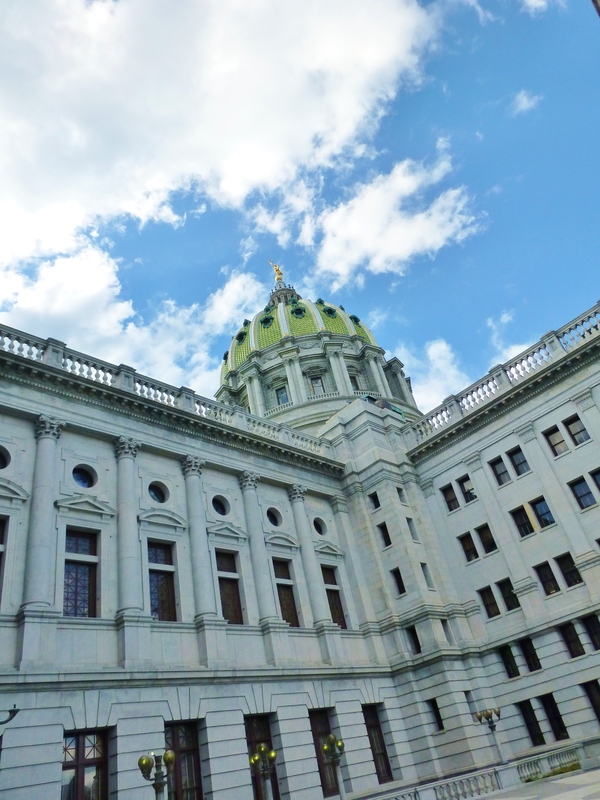 Many people, including Theodore Roosevelt, himself, have said the Pennsylvania Capitol Building is the most beautiful of any in the country. After seeing it for myself, I believe he may be right. 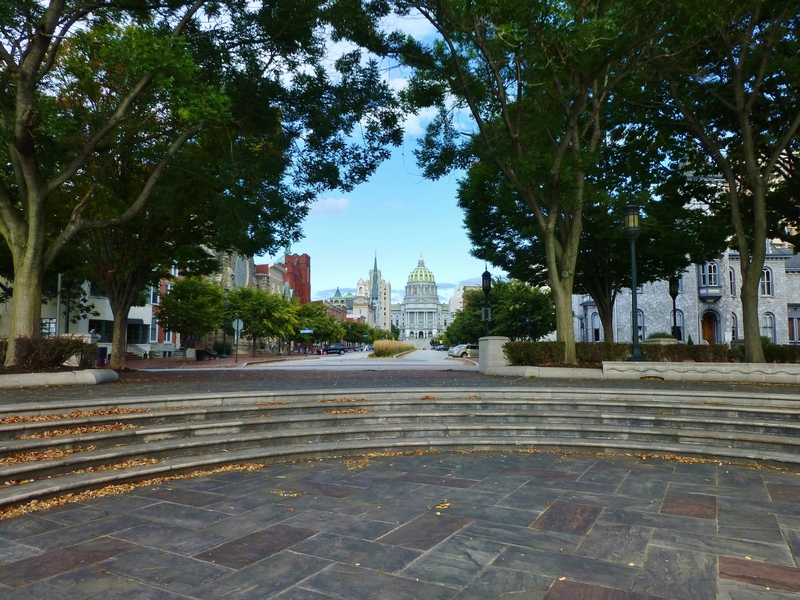 Last fall, I had the opportunity to visit Harrisburg, the state capitol of Pennsylvania. My son, Grady, was being inducted into the National Junior Honor Society at a ceremony nearby, so we were joined with my parents and my sister from the Pittsburgh area to celebrate, and make a fun long-weekend out of the trip. 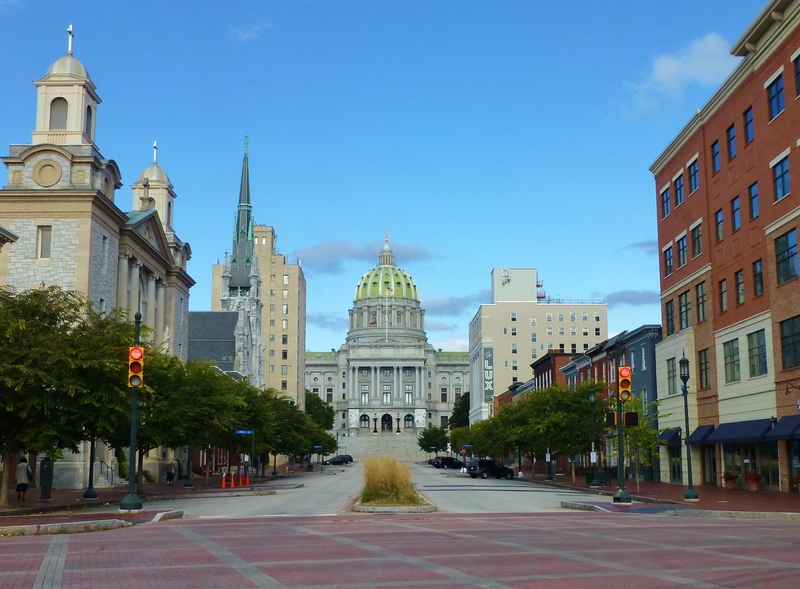 This was my first visit to Harrisburg (other than driving past it on the Turnpike) and at the top of my list of things to do was a tour of the Capitol Building. 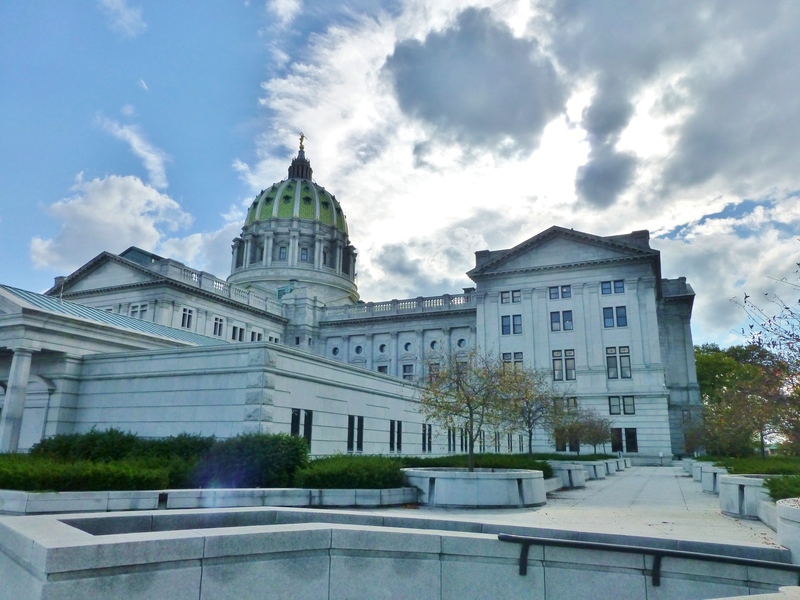 I had read that many people, including Theodore Roosevelt, himself, have said the Pennsylvania Capitol Building is the most beautiful of any in the country. After seeing it for myself, I believe he may be right. 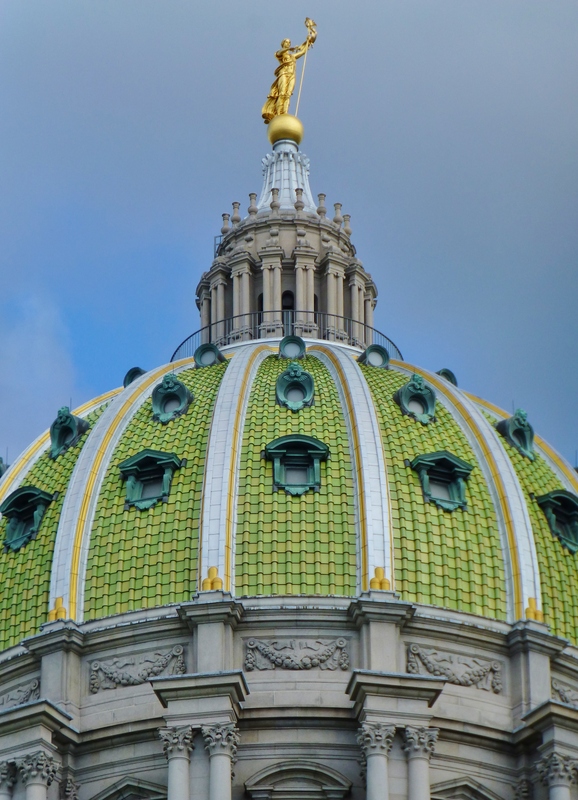 The Pennsylvania State Capitol’s five-story exterior is faced with handsome Vermont granite, and the roof is composed of green glazed terra cotta tile. We were there on a gorgeous October day! The Capitol was designed in the American Renaissance style by Philadelphia architect Joseph Huston (1866-1940), who envisioned the building as a “Palace of Art.” It opened to the public on August 15th, 1906. A detailed look at one of the amazing carved marble statues which flank the front entrance to the capitol building in Harrisburg, PA. The spectacular building as seen from the back. The Capitol’s centerpiece is an amazing 272-foot, 52 million-pound dome inspired by Michelangelo’s design for St. Peter’s Basilica in Rome. Built and furnished at a cost of $13 million, the Capitol features paintings, stained glass and furnishings by some of the best artisans of the day. 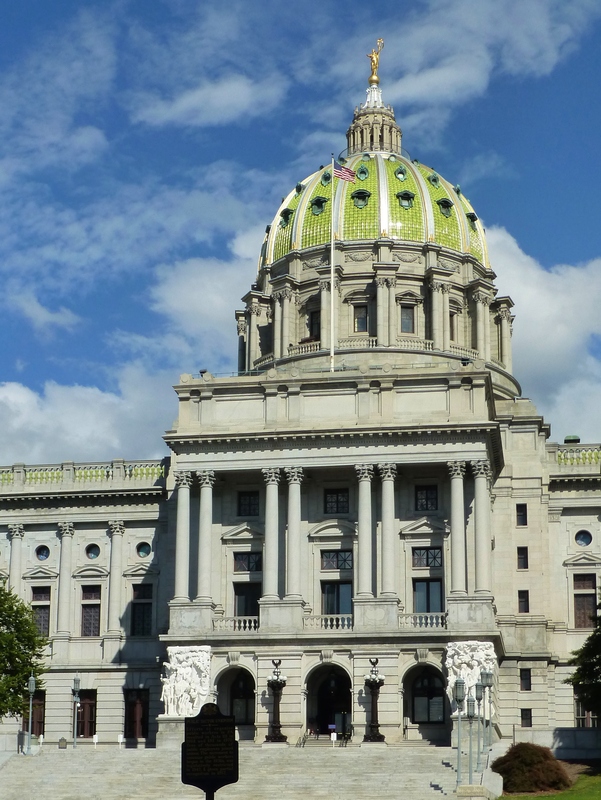 The Pennsylvania Capitol Building is quite vast and is part of a whole complex of government buildings, all of which are National Historic Landmarks. The total height of the Capitol building is 272 feet. The complex incorporates fabulous terraces and outdoor gardens with many beautiful fountains. 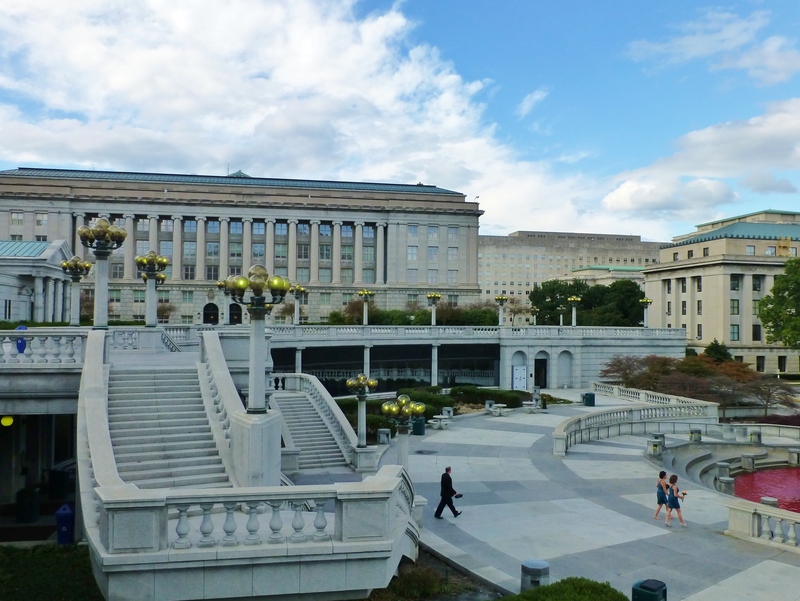 Here is one of several smaller fountains surrounding the exterior of the Pennsylvania State Capitol Building. I love the Grecian forms used here and all around the complex! Throughout the main building, Huston blended the various styles with motifs featuring Pennsylvania’s achievements in labor, industry and history, making the Capitol uniquely American. 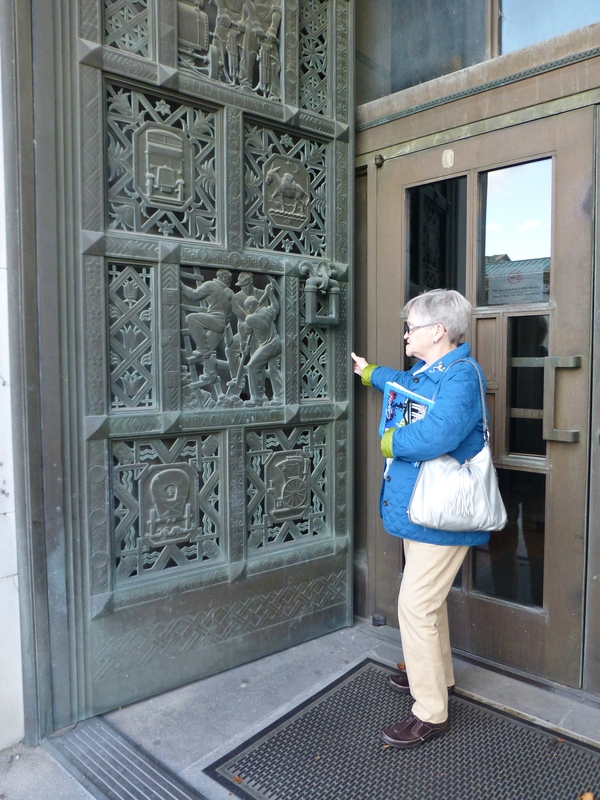 This is my Mom standing in front of an enormous, amazingly detailed door at the capitol building. The artfully executed door had different professions featured on various panels, which were placed in a grid, almost like a quilt. The workmanship here is just phenomenal! 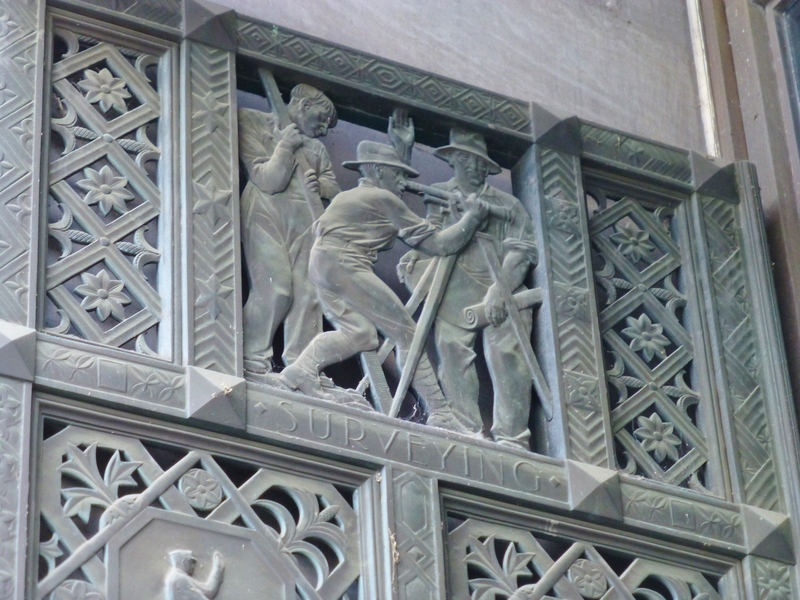 A detail of the ‘surveying’ panel on one of the bronze doors at the Pennsylvania State Capitol Complex in Harrisburg. The main rotunda entrance to the Capitol Building is on State Street, as seen here. State Street is quite lovely with historic buildings on either side and a beautiful grassy strip up the center. 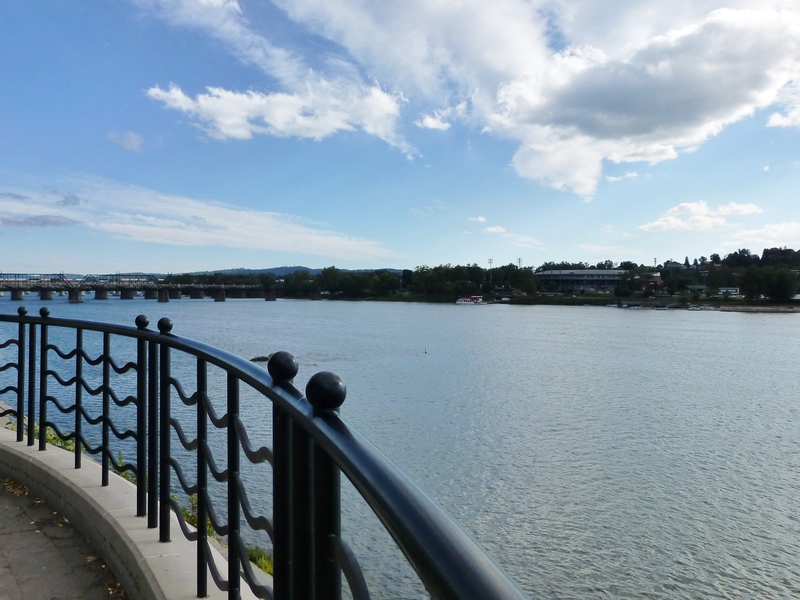 Facing the opposite direction on State Street, is the beautiful Susquehanna River. What a beautiful sky we had on that October day! 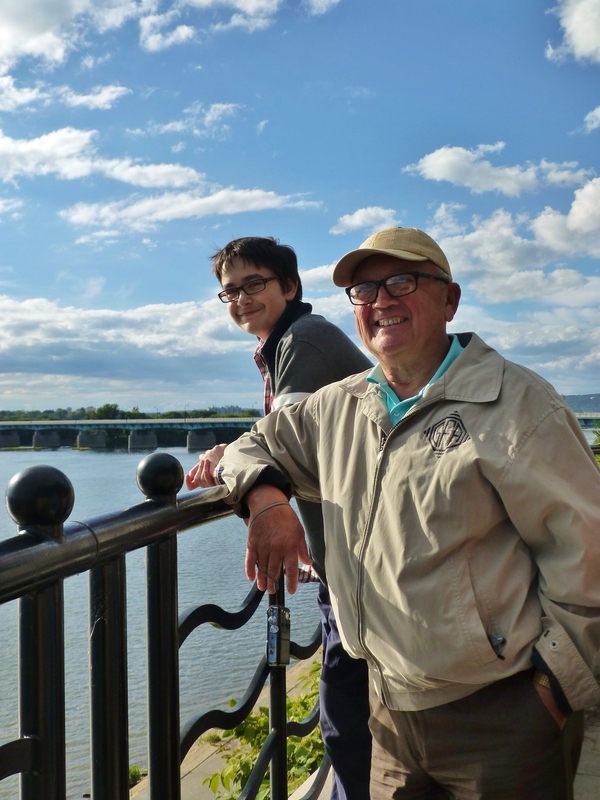 A lovely park is located at the end of State Street, placed to enjoy views of the Susquehanna River. From here, you can see the Capitol Building looking just beautiful at the opposite end of the street. Grady and my Dad enjoying the view at the park in front of the Capitol Building. 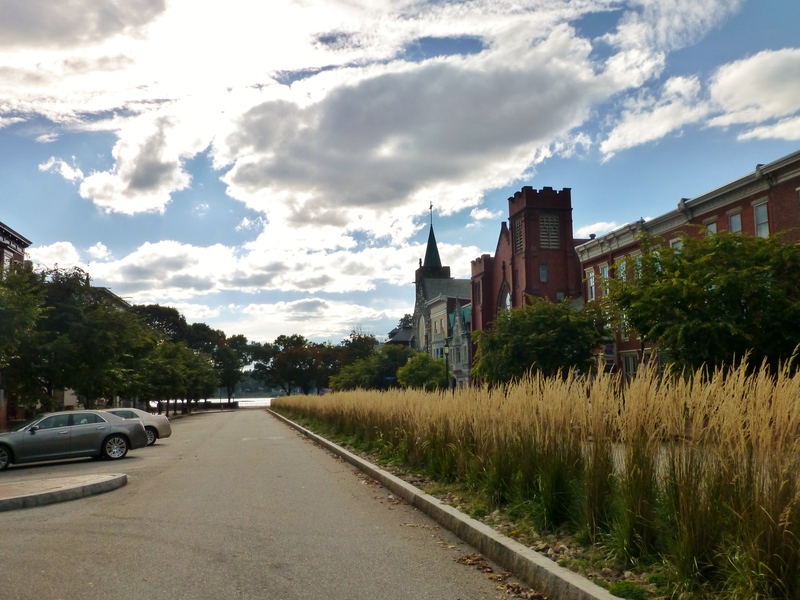 There are beautiful views across the river to City Island from here. City Island is home to a ballpark, miniature golf, picnic pavilions and many other recreational activities. From here you can also catch a ride on the ‘Pride of the Susquehanna’ Riverboat. 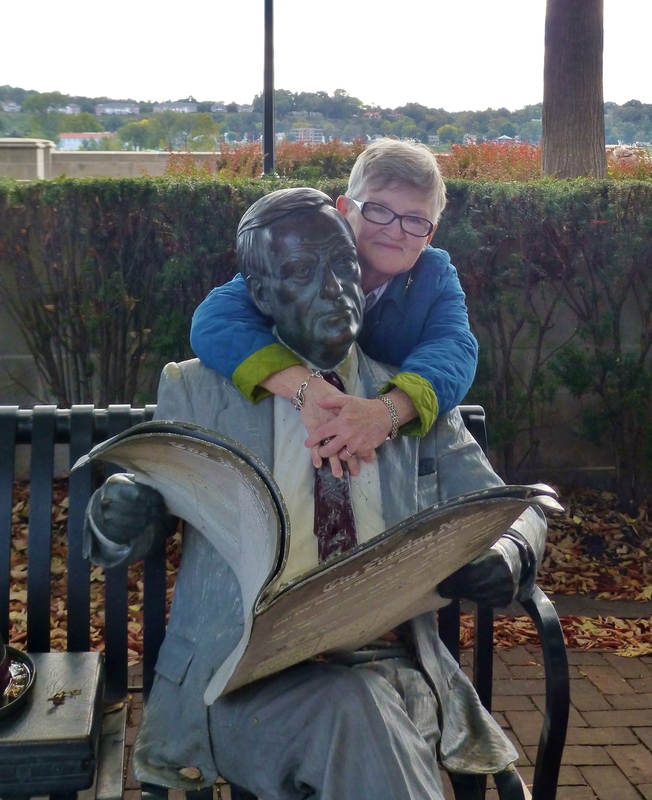 Also in the park is this delightful sculpture by the noted artist J. Seward Johnson, Jr. This sculpture is called ‘Waiting’. I love my Mom’s sense of humor here! She makes me laugh. I’ll leave you with this one last view of the enormous 94-foot diameter, green tiled dome of the main rotunda at the Pennsylvania State Capitol building. The dome is topped by a gilded brass statue of ‘Commonwealth’ by the artist Roland Hinton Perry. She stands 15′ 6″ tall atop a 4-foot diameter ball. Isn’t she just gorgeous framed against the bright blue sky? How marvelous! While on the free guided tour of the Pennsylvania State Capitol building (Pennsylvania views this as a public service), I took many fabulous photographs of the phenomenal interior, but I’ll leave that for another post. So what did you think? 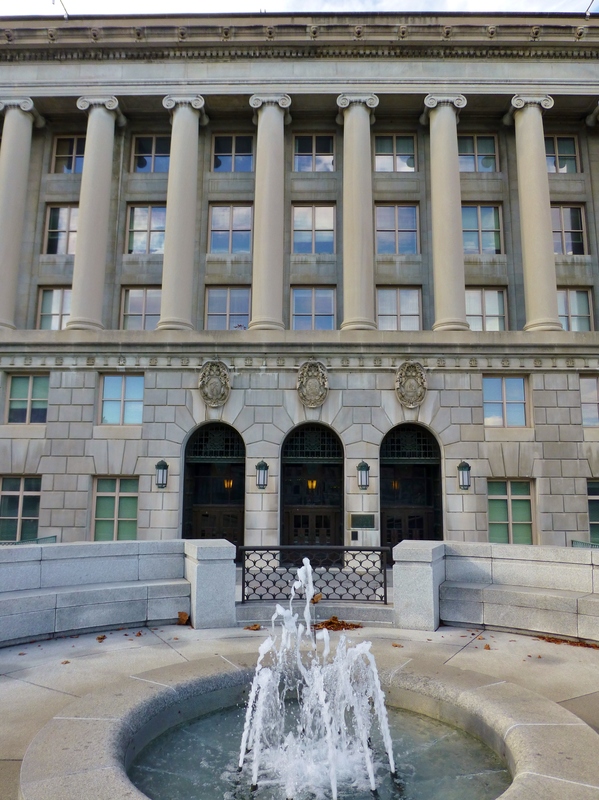 Are you inclined to agree with Theodore Roosevelt’s assessment of this lovely building? I believe it’s truly an architectural masterpiece and well worth the trip to the center of the state. I’m really glad we visited and will definitely go back again to take a second look…there’s just so much to see! Until next time, please tell everyone you know about Kristine Robinson’s blog. Feel free to pin these images on Pinterest, or share on Facebook. I love making new friends! 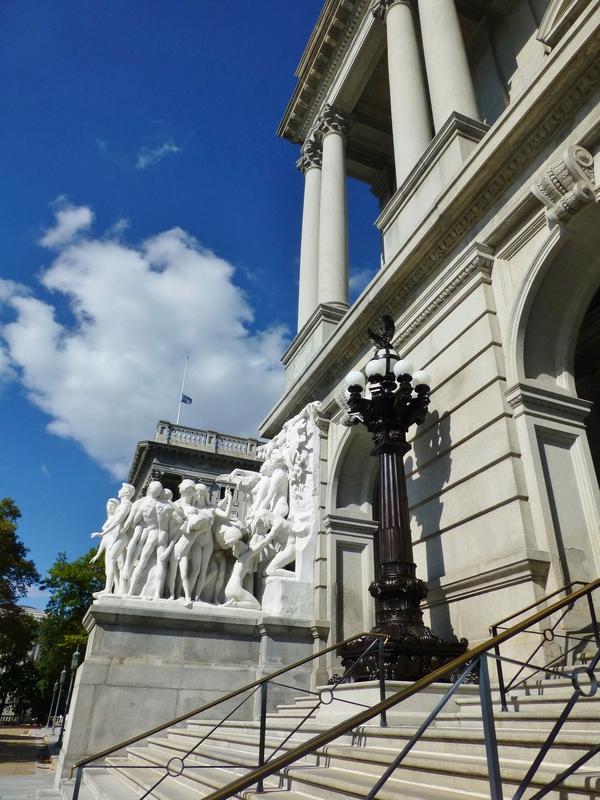 This entry was posted in Architecture, Historic Sites, Pennsylvania, State Capitol Building, Travel and tagged Capitol Building, City Island, Harrisburg, J. Seward Johnson Jr., PA, Pennsylvania State Capitol Building, Sculpture, Susquehanna River. Bookmark the permalink.